To make the next part of our exploration as widely accessible and understood as possible, our goal will be to continue to minimize the amount of math and physics to the greatest practical extent: keeping things as simple as we can without doing violence to the phenomena. Think of it as a ‘studies’ approach. Therefore, I will try to base analyses upon relative differences in ‘sum totals’ and relative percentages or fractions to some baseline. We can’t get away from a minimal discussion of the nature of acceleration versus drag, but we can illustrate the things about drag and acceleration that we need to grasp without crunching too many of the numbers. Which is a good thing, because without the need to know, we don’t have the actual F-35 numbers (ex: drag values) available to us in the public domain for plugging into any calculations anyway. First we’ll summarize the relevant things we now know-- or think we know-- about the F-35’s Transonic Acceleration KPP and overall performance. We will focus on the F-35A model in examining the relevant physics of accelerating through the transonic region and how they affect all aircraft and in particular the F-35A. We’ll then follow with a discussion examining just one likely ‘workaround’ that the F-35A might operationally employ (if it is even needed), and discuss the ‘tactical’ impacts and whether or not what may obviate or mitigate whatever the ‘popularly-perceived’ operational challenges the F-35 variants endure passing through the transonic region. Here is what we know or has been reported as stated by the F-35 Program Participants including the user communities that will help guide the discussion. Note: We’re numbering the references for easing later analysis and possible discussion. 2. A Lockheed Martin representative was quoted in Air Force Magazine (cached) as stating the F-35 can maintain Mach 1.2 for a dash of 150 miles without using afterburners. Adding: "Mach 1.2 is a good speed for you, according to the pilots,". 5. …U.S. Air Force Lt. Col. Eric Smith, director of operations at the 58th Fighter Squadron at Eglin Air Force Base, Fla., and F-35 test pilot, said that flying the aircraft is a thrilling experience. 7. 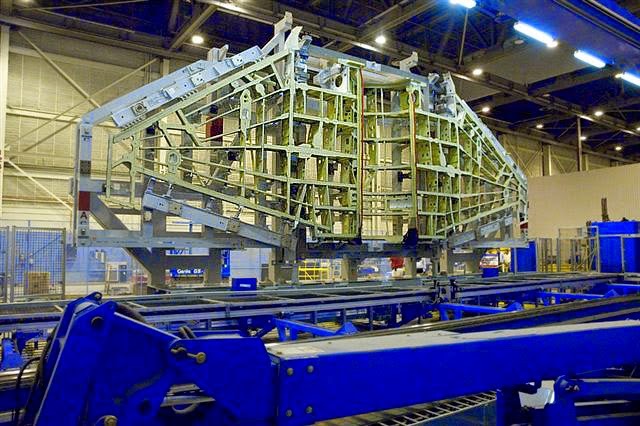 The weight purge of a few years ago was so “intensive,” Crowley said, that “there’s not thousands of pounds” of weight left to be saved on the F-35. However, even with a three percent annual weight growth, the key performance parameters, or KPPs, won’t be affected. For any performance-related requirements, we artificially penalise [sic] the engine by five per cent fuel flow and two per cent thrust. Those margins are given back as we mature the design and get more and more solid on exactly what it is going to do. They are there for conservative estimation up front. We have not taken back any of those margins yet so, when those margins are taken back, the airplane will continue to be well in excess of its basic requirement. A) A Model: The original “threshold” Key Performance Parameter (KPP) specification time for transonic acceleration (.8 to 1.2 Mach) was ≤ 55 seconds at 30Kft Altitude. B) B Model: The original “threshold” Key Performance Parameter (KPP) specification time for transonic acceleration (.8 to 1.2 Mach) was ≤ 65 seconds at 30Kft Altitude. C) C Model: The original “threshold” Key Performance Parameter (KPP) specification time for transonic acceleration (.8 to 1.2 Mach) was ≤ 65 seconds at 30Kft Altitude. These times were asserted in an oft-referenced Air Command and Staff College paper authored in 2008 by a then-Lt Commander Geoffrey P. Bowman (USN). These numbers have been repeated in the popular aviation press (example) and Australian Air Force Air Vice Marshall Osley came close to ‘anecdotally’ confirming the F-35A KPP as asserted in the ‘Bowman Paper’ in testimony before an Australian Parliamentary Committee in 2013. The aircraft gross weights and fuel loads for the KPPs have not been revealed, though the Bowman Paper observes they are for internal-only weapons load configurations. Dr JENSEN: Air Vice Marshal Osley, in a previous hearing you responded to APA's criticism of the F35's aerodynamic performance and you said that it is inconsistent with years of detailed analysis undertaken by Defence, the JSF program office, Lockheed Martin and eight other partner nations. Given that the Director of Operational Test and Evaluation has indicated that the JSF program office, the JPO, has asked JROC to reduce the sustained turn and the acceleration performance essentially to exactly the numbers that APA was predicting years ago, what does that say about the detailed analysis by Defence, the JSF program office, Lockheed Martin and the eight partner nations? Air Vice Marshal Osley: The points that the Director of Operational Test and Evaluation made there about the manoeuvrability, as you point out it was the sustained turn and the transonic acceleration. He pointed out that the targets that have been set for those parameters were not going to be met by the F35. The figure of I think it was 55 seconds for transonic acceleration, the F35 was going to take 63.9 seconds to do that. That is obviously at a certain altitude, I think it was 30,000 feet, and a range of mach 0.8 up to mach 1.2. The point to make about those is that that acceleration by the F35 is in a combat configuration. If you look at the legacy aircraft and we talk about comparable performance, a legacy aeroplane would require weapons and, obviously, external fuel tanks to be in combat configuration. An interesting factoid, one of the USMC test pilots mentioned this little tidbit—they have to use a modified Rutowski profile in order to get the F-35B and C up to Mach 1.6. Basically, you do one push over, unload the jet and accelerate, get up to 1.2, turn and repeat until you hit 1.4 Mach, turn and repeat till you hit Mach 1.6. It just barely gets there and barely has any gas left over afterwards. The kinematics are basically F/A-18C-like, though that was apparently exactly what was expected…. If the final speed is near the aircraft’s maximum speed, the large speed increase necessary renders the conventional method of using the peaks of the Ps curves useless. However, the energy method works well. Note in this example the optimum climb path includes an acceleration in a dive. This optimum energy climb path is also known as the Rutowski climb path, after its developer. The path (Figure 7.14) [at the link] consists of four segments to reach energy state E in minimum time. Segment AB represents a constant altitude acceleration from V = 0 to climb speed at state B. The subsonic climb segment follows a path similar to the one illustrated to the tropopause at state C. This subsonic climb is usually a nearly constant Mach number schedule. An ideal pushover or dive is carried out at constant Eh from C to D. The acceleration in the dive is actually part of the optimum climb path. 11. There’s a Block 50/52 (F110-GE-129 or F100-PW-229 powered) Dash-1 supplement (Hellenic Air Force) out on the web that provides significant insight as to the F-16 performance baseline used to set the original F-35 transonic KPP. Why the differences, and why by ‘that’ much? IMHO these differences would make an excellent case study for an introductory course on aircraft design if only to just illustrate how much even small differences in design can affect aspects of performance in large ways. I can’t think of any other case where there are three ‘operational’ combat designs that are so close to each other but still different enough to tease out likely drivers of performance differences. (I am excluding aircraft that have had all sorts of various bulges and blisters scabbed on post-manufacture). The first question that springs from observing these differences is how much of the variation is due to variation in aerodynamic shape, propulsion efficiency, and weight? 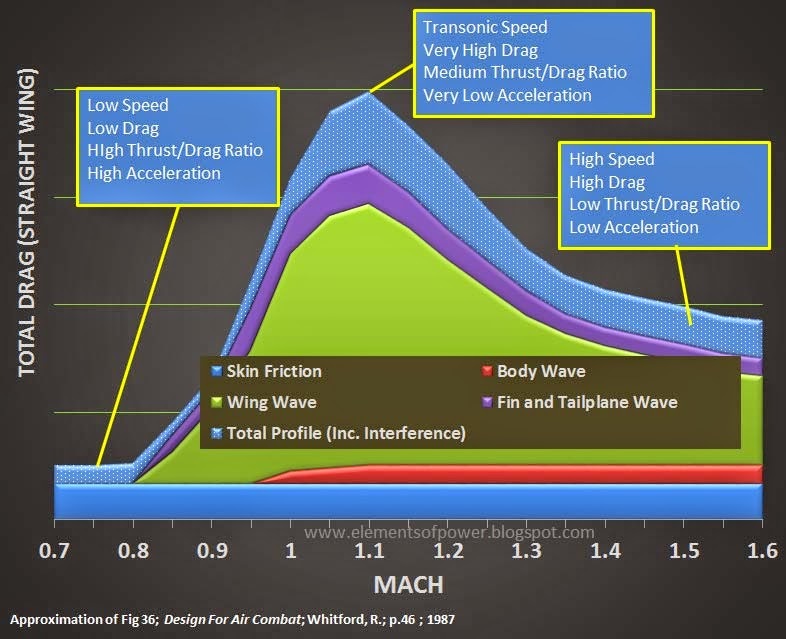 As the range of airspeed from .8 Mach to Mach 1.1 is the same, and the same air density (same altitude) are common to all variants, this reduces the number of variables on the drag side of the thrust-drag equation to two: the Drag Coefficient and the Cross-Sectional area. On the thrust-side of the equation, we will have less to work with but not so much less as to prevent us from making several observations and ‘educated’ estimations. Since this little exercise is about ‘understanding’ and not ‘quantifying’, I am comfortable working within these limitations. We’ll model some likely weights (based upon the ‘Bowman Paper’ and acknowledged fuel and weapons carriage plans). Why ‘weight’? Because it is an excellent proxy for examining relative lift differences between the variants which “weight”, in level flight, must equal “lift”—the major constituent driver of ‘drag’. These configurations, whether exactly those used for the Transonic Acceleration KPP or not, are at least representative of the aircraft weights before release of air-to-ground stores and at the mid-mission point. They are therefore ‘realistic’ for use as a baseline for our explorations. They also cannot be too far off relative to each other to make too much of a difference in our search for understanding, as the only variable is fuel weight and the lower F-35B model JDAM carriage capability. Using the F-35A Model weight as the basis, we find that over a range of mid-mission fuel loads, the F-35C weight, and therefore lift needed to be generated in level flight to be around 13-14% higher than the F-35A. We can therefore conclude that the wing wave drag coefficient percentage contribution to the total drag coefficient that is due to lift for the F-35B is less than the F-35A (under the same flight conditions in the speed region we are looking at of course), and that the F-35C’s wing wave drag coefficient contribution due to lift is significantly higher than for the F-35A. Further, we can conclude there is little, if any, difference between the wing wave drag contribution due to volume for the F-35A and B because the F-35A and F-35B wings are identical in area: they have the same fixed length (chord), and span. We also know the area of the A and B wings are identical and their cross-sectional volumes very nearly so (more on this in the next section). 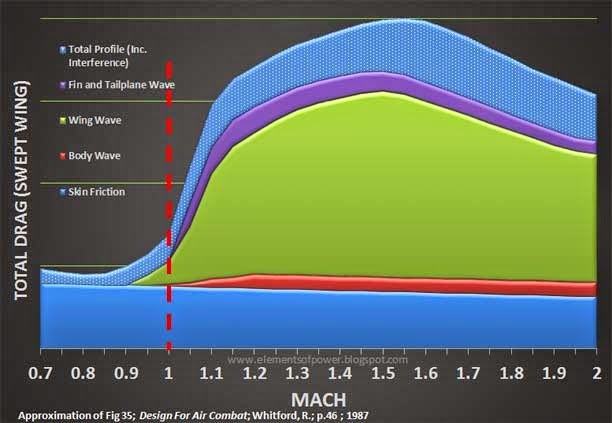 We can also conclude that there is a large difference between the F-35A and F-35C in wave drag contribution as a percentage of the total drag due to both lift and volume. This is because the F-35C has a much bigger wing and control surfaces (more on this too in the next section). 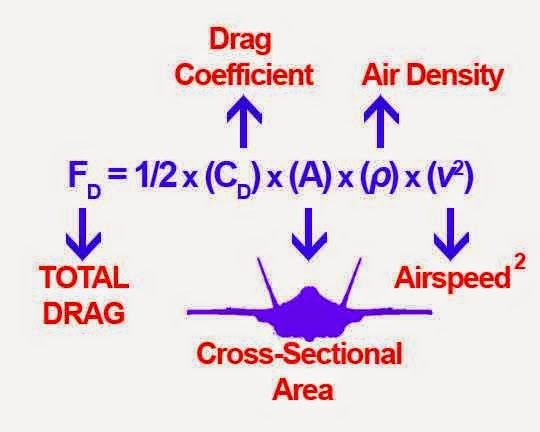 The overall coefficient of drag for the F-35C might theoretically be smaller than the A or B at some points along the curve, but that would have to come from reduction in the total drag via other means. For all we know, the total volume distribution of the F-35C comes closer to an ideal Sears-Haack distribution than the other two variants. We cannot definitively rule this out without more data, but given the differences between the F-35A and C in transonic acceleration, I believe we can assume with some relative confidence the F-35C has an overall drag coefficient much, much, higher than the A model, and even if the F-35C drag non-wing coefficient was lower than the A model, it certainly does not overcome the F-35C’s larger cross-sectional area. 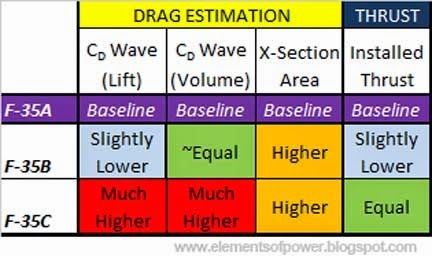 If the differences in drag coefficient due to wing lift were the only effective differences between F-35 models, we would expect the F-35B to have better transonic acceleration more on a par with the F-35A due to it weighing less when loaded, and we would expect the F-35C to be much slower in accelerating in level flight than either the A or B model. Since the A model has the best transonic acceleration, we should assume there is some other factor (or factors) affecting the F-35B performance beyond wing wave drag. Also, while it appears the C is the worst performer in transonic acceleration, it is almost certainly NOT due solely to wing wave drag contribution to total drag coefficient. This leads us to the next discussion, Aerodynamic shaping. Even this kind of comparison without hard data would be impossible if we were comparing completely different aircraft, or if we were seeking to quantify the differences instead of just understanding them. The good news is our limitations will make this section mercifully short. First, we find that the cross-sectional differences between the F-35A and C are different in nature and scale than the differences between the F-35A and F-35B. The differences between the F-35A and B are more in the 'non-direct' lift regions of the cross-sectional area and are obviously due to the B model lift fan installation (#7). The wing profile is slightly increased at the lower wing root (#6) due at least in part to the STOVL roll-control system installation. The shape differences between the F-35A and F-35C are far greater. First, wing (#3) and horizontal stabilizer (#2) extensions as well as the taller vertical stabilizers (#1) add significant cross sectional area to the C model. 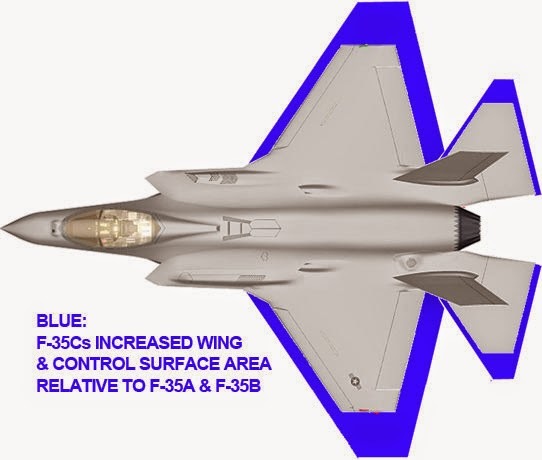 Further, it appears the C model wing cross-section is indeed thicker (#5) than the F-35A’s to support the greater wingspan, but this could be an illusion from a longer curved under-surface and/or wing twist (either way, this presents an increased cross-section perpendicular to the airstream versus the A or B model). The F-35C wings also present an effectively increased cross-section to the airstream at the wing-folds (#4). The F-35A and C do have a slightly increased cross-section versus the B model in the area of the tail hook enclosure (#8) but unlike the other cross-sectional areas, it is unclear how much of this is area that is presented perpendicular to the airstream in level flight. Not known is if there are unseen relative differences in inlet design that affect not only installed thrust but also effective cross-sectional area, bur I believe we've captured the dominant difference drivers. As already noted, Wave Drag due to ‘volume’ as a contributor is characterized in terms of a cross-sectional area for some fixed length. The F-35C is overall slightly longer than the F-35A and B, but its lift surfaces also have a significantly longer “fixed length” than the near identical F-35A and B surfaces. The F-35C’s wing and tail surface wave drag contribution due to ‘volume’ is therefore significantly greater than that for the F-35A and B. As a result we would expect the total drag of the F-35C in level flight to be much greater than the F-35A or F-35B due to having both a higher wing wave drag coefficient and greater cross-sectional area. Whereas the first two topics of weight and aerodynamic shape dealt with the drag side of the acceleration equation, the engine installation aspect is relevant more on the thrust side of the equation. This is actually a pretty simple thing to compare on the F-35, as all three engines are essentially the same, with the major differences (performance wise) being between the F-35A/C engines and installations being highly common and the F-35B engine installation being very different from the other two. The physical differences of the F-35B installation-- the integrated lift-fan at the front of the system, the articulated exhaust duct with a different afterburner and nozzle installation at the other end, as well as a roll control nozzle system tapping flow off of the core engine in the middle cannot ‘help’ the conventional-mode of operations. Any significant performance differences between the F-35A and C engines would have to be due to any installation differences that are not apparent/acknowledged. For all practical purposes, we should then expect the F-35A and F-35C engines to have “the same” installed thrust and efficiencies. On the other hand, with the F-35B we would expect installed thrust penalties due to the added mass of the lift fan drive shaft and open roll-control ducting, the shaft passing through the bifurcated air inlets where they meet, as well as the different exhaust nozzle. We don’t know for certain, but it makes sense to believe the F-35B engine installation may be somewhat less efficient than the A or the C model in the conventional operation mode. In these same factors and relationships we find the seeds of understanding the operational implications of the F-35’s performance relative to each other in regards to the Transonic Acceleration KPPs. Transonic Acceleration: What is it good for? It has been determined by the F-35A program’s analyses that the original Transonic Acceleration KPP for the modeled F-35A will be exceeded by 8 seconds, taking 63 instead of 55 seconds. 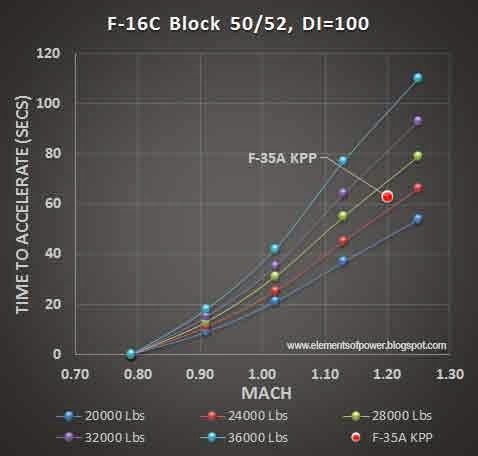 But considering we have multiple sources (#5, #6 above) citing excellent acceleration characteristics compared to an F-16 that imply superior initial acceleration, and the analyses are based upon degraded engine performance (#7, #8 above) how likely is it that the 8 second difference is even operationally relevant? Take a look at a second hand on your watch or clock. Watch it for 8 seconds. If you were going M1.2 at the end of eight seconds, how fast were you going at the start of the eight seconds? M1.19? M1.18? Just from the drag equation and the drag coefficient charts we know that acceleration will be much greater at the start of the acceleration run than at the end. Is it possible the F-35A exceeds the initial predicted acceleration but just barely misses the full expectation? Answers to these questions could have bearing as to whether or not extending the KPP by 8 seconds was even operationally relevant. As it stands, it should still be viewed as superior to a Block 50/52 F-16. As we will see, Kloos (Ref #6) understates the F-35A’s abilities compared to the Block 50/52, at least at the 30K ft KPP altitude (Ref #10). 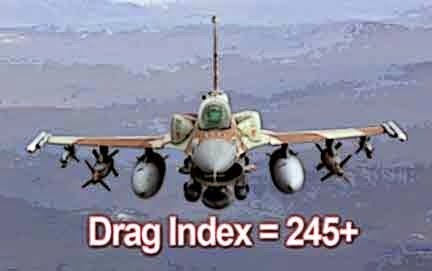 If we examine the F-16’s ‘Combat Max AB’ transonic acceleration data (Ref #11, Table A8-12), and compare it to the F-35A’s newest transonic KPP time (63 seconds) we find the F-35A loaded with two AMRAAMs and two 2KLb JDAMs has better acceleration than the F-16C/D in 20 of the 30 possible weight/drag index combinations shown in the tables (weights from 20K lbs to 41K lbs, and Drag Indexes from 0 to 250). The F-35A KPP is on par with the F-16 in one of the possible F-16C load-outs. At least three of the remaining nine F-16 load-out combinations I would characterize as ‘highly impractical/improbable’ (for those you can have a few hundred pounds of usable fuel, or you can have two AMRAAMs but you cannot have both). Three more F-16 combinations involve simply carrying two more 600 gallon fuel tanks with various degrees of ‘fullness’ along with just two AMRAAMs and no other weapons other than the ever present 20mm cannon. On the other hand, for 6 of the 20 load-outs where the F-35 KPP performance meets or beats the F-16C, the F-16 can’t even GET to Mach 1.2 (for three combinations the F-16 performance is ONLY subsonic). LANTIRN pods, it can only carry just a little more internal fuel before the F-35A's latest transonic acceleration KPP standard can be said to be ‘better’ than an F-16C Blk50/52 in transonic acceleration. 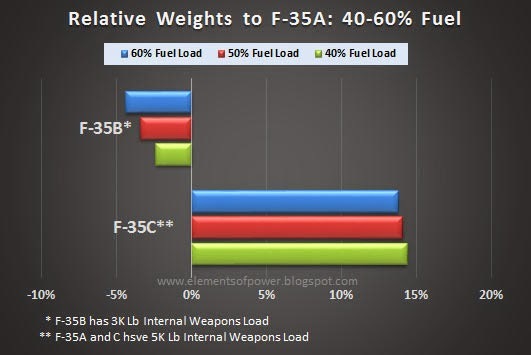 Figure 18: Only 2 AIM-9s greater load than F-35 Internal Load Out. It'll need those AIM-9s long before te F-35 will. 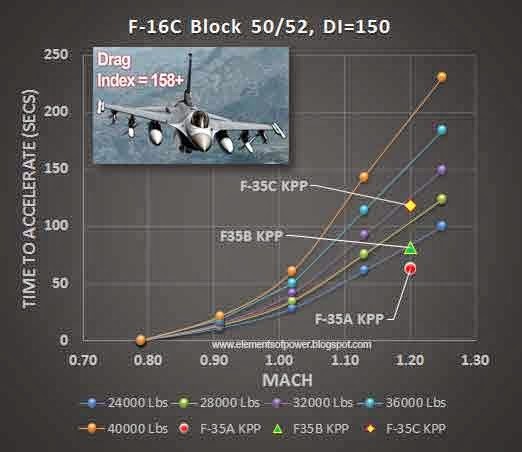 Figure 19: With comparable war loads: F-35A and F-35 B beats all & F-35C beats most F-16 configurations. The ‘meaning’ we can derive from the revised F-35A transonic dash KPP is this: It still represents the stated ‘F-16 Like’ performance goals and overall, it exceeds them. Other than that, everything else is guesswork. ‘What If’ Operational needs require the F-35A/B/C to get rid of all or part of those extra darned seconds enroute to Mach 1.2? THAT topic we will address in closing the series in Part 3. Soon thereafter, I posted a short series where in the first part it was highlighted that the only truth one could conclusively draw from the Sustained G Spec change was that the F-35s would have slightly reduced sustained turn bank angles than planned. Anything else, including the relevance/significance of the change, would be speculation without additional knowledge. We then explored what such a bank angle reduction MIGHT mean by performing parametric ‘what if’ exercises based upon certain assumptions. 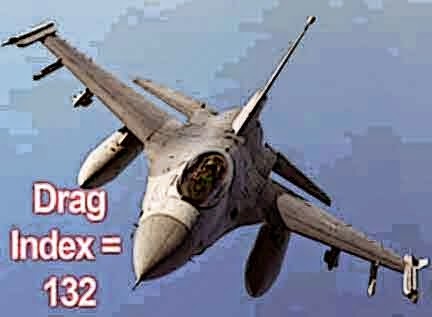 What we discovered was, is that the most important unknown appears to be aircraft total loaded weight and that the “baseline standard used [in developing the F-35 Spec] for the comparison was a clean Lockheed F-16 Block 50/52 with two wingtip Raytheon AIM-120 AMRAAMs”. In other words, the Sustained G spec was based upon an F-16 in a lightly loaded, and operationally-limited and therefore very non-typical ‘lightweight’ configuration. When an F-16A was loaded in a manner similar to the F-35’s ‘stealth’ weapons load, we found the F-35 may very well be significantly better than the F-16 in the ‘sustained turn’ category: It all depends on how heavily loaded each aircraft is relative to the other. 3) it had to be loaded so lightly that it could only have a little over 8 minutes of fuel on board to achieve its maximum Sustained G turn performance. I also note here, once again, that ‘Sustained Turn’ is not now seen as important of a maneuverability parameter in the post-‘All Aspect’ missile era as it was before the all-aspect attack guided missile: Sustained Turn was more important when it was essential to get right on your enemy’s tail for a ‘kill’ while keeping him off yours. I had left the transonic acceleration spec changes alone at the time it was ‘all the news’ because when I finished the ‘Sustained G’ posts, all the F-35 haters, anti-defense weak sisters, faint-of-heart, and the Joe Public mouth-breathers had pretty much moved on to complaining about something else. Also by the time I finished the Sustained G discussion, I didn’t really have the free time to quickly distill an explanation about transonic acceleration—or at least do so such that most people could understand the phenomenon if they put a little effort into understanding. After all, you can’t really simplify transonic acceleration with the same ease that you can with ‘sustained G’ because the former is about dynamic ‘change’ while the latter is about representing different states of equilibrium: nice and easy ‘steady state’ conditions. A while ago though, I was reading a comment thread ‘someplace’ where there was ‘someone’ mixing claims about acceleration performance with top speed performance for the F-35C and complaining about the F-35 having to ‘dive’ to get to its top speed. I’m pretty sure he was referring to a comment made by a test pilot at PAX River (Naval Air Station Patuxent River)--also a while back--who talked about having to “accelerate, turn, unload, and accelerate” repeatedly within PAX’s range space to get the F-35C up to its top sustained speed of M1.6 using a ‘modified Rutowski’ procedure. I believe the commenter was incorrectly translating the ‘unload’ into a need to dive, versus the need to preserve speed during turns, just to make going through the exercise worth the effort within the limited range airspace allotted. This poor person’s mental flailing-about on something he clearly did not understand (alternatively, I suppose he could have been disingenuously misleading others--whatever) got me thinking again as to how we could best give some perspective as to what the announced changes to the transonic acceleration performance of the different F-35 variants might actually ‘mean’ without having someone pulling a synapse and then mentally limp right past the ‘Eureka!’ moment. Having thought about the subject for a while now, I now don’t think it’s too ‘hard’ of a write-up to produce – It’s just a tedious one. Because the media and others tend to use a shorthand to describe Key Performance Parameters (KPPs) as ‘specs’ or ‘Specifications’, we shall reluctantly do the same. KPPs are selected based upon their relevance to top level program requirements such as survivability, lethality, supportability, etc. The KPPs are the basis, as former F-35 PM Tom Burbage noted in 2012, “from which lower level detailed engineering specification are derived and Lockheed's job is to meet as many of those specifications as possible within the laws of physics”. In other words, KPPs are a vehicle used for deriving detailed engineering requirements from top-level operational requirements. They are initially established before the first design iteration comes out and it is not uncommon for them to be adjusted as more information about operational requirements and/or understandings of technical feasibility are refined. Though we will treat KPPs as requirements for the sake of simplicity, we need to understand that they are not immovable goals (or thresholds) that must be individually or collectively met, but instead are guideposts that show the way toward defining and then meeting engineering requirements that will support overall top-level program requirements. I’ve touched on this subject before, and this link still leads to the DoD Manual for the Operation of the Joint Capabilities Integration and Development System (JCIDS) which, with the references listed within the document, describe how requirements are determined and used, including the role of KPPs in the requirements process and the required steps/approvals to change KPPs. If you know all this already, go ahead and skip the discussion about aerodynamics. If you know his stuff and read this part anyway, you will see there will be a lot I’m leaving out or perhaps oversimplifying. But I do so on purpose. Once again we’re conveying enough information to get an idea across, and not enough to go design an aircraft. These are just the ‘basics’, on the ‘basic concepts’ needed to understand what we’re going to discuss. 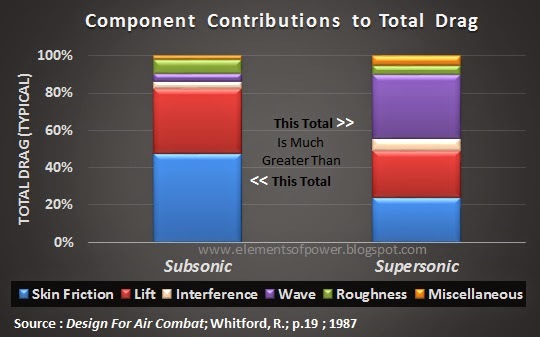 Remember, not only do the relative contributions of the drag components change going from subsonic to supersonic, but the resultant drag for nearly all the ‘contributors’ increase as well. 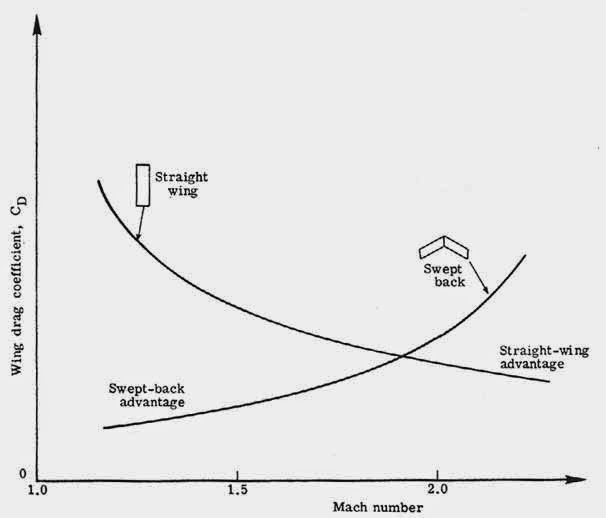 For example, here is a reconstruction of a typical straight wing drag profile, expressed in terms of drag coefficient (Cd): a dimensionless value used in calculating total drag (force). The only mysterious-to-some element in this equation should be the Cross-Sectional Area. This is the cross-sectional ‘slice’ of aircraft area presented to the air stream, and is perpendicular to the airflow passing over the aircraft. 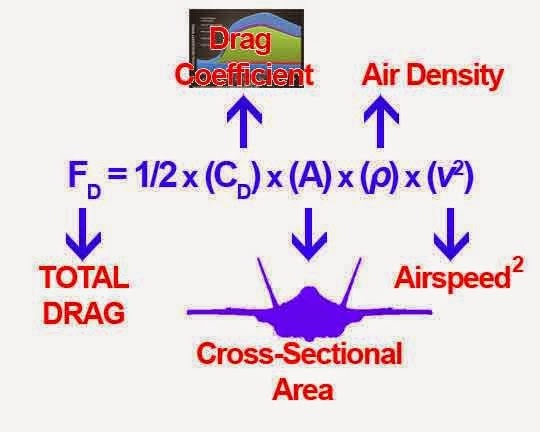 As the equation indicates, given the drag coefficient and cross-sectional area of any aircraft, drag increases as airspeed increases and when air density increases (density altitude decreases). Keep this equation in mind as we go forward: we will be relying on and referring to it from this point forward. Note the effect of using the swept wing configuration. 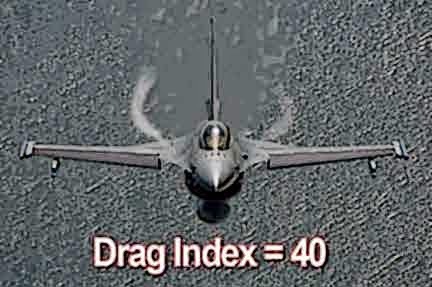 It delays the rapid onset of drag rise and also pushes the peak drag coefficient to higher Mach numbers. Remember also that this graph is scaled against peak drag coefficient at around Mach 1.55, with horizontal gridlines spaced at ‘25% of peak’ increments. The F-35 wing is a straight wing with swept leading edges. I suspect the F-35’s drag curve may be shaped something like a hybrid of the sample straight and swept wing curves shown, with a bias towards the straight wing drag rise curve shape. 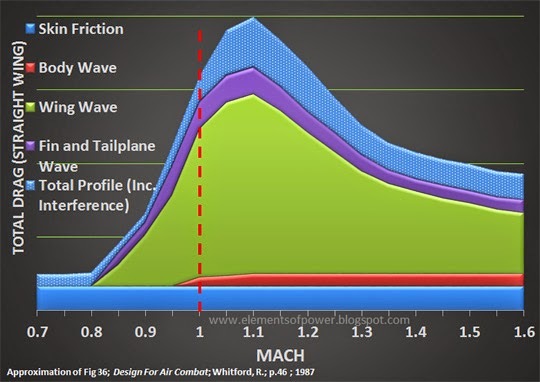 The acknowledgement that the F-35 can go some distance above Mach 1.2 without afterburner (to be shown in ‘What we know or think we know’, Ref #2 in Part 2 coming up) is a good indicator of the F-35A's drop in drag coefficient after Mach 1.1 as shown in the straight-wing graph vs a peak at Mach 1.55 as shown in the swept wing example. In case someone is asking the question, a simple NASA graphic drives home the point that a [swept] wing is ‘the way to go’ if a primary design concern is to reduce drag coefficient below about Mach 1.8. But there are other concerns, when it comes to fighter aircraft (such as 'maneuverability' and 'g-loading') that a straight wing provides certain advantages--such that a 'compromise' is often sought by sweeping the leading edges on an otherwise straight wing. To accelerate at any speed, the thrust must be greater than the drag opposing the thrust. Jet engine thrust also decreases as the aircraft speed increases, because the difference between the aircraft velocity and the velocity of the engine exhaust becomes smaller as the aircraft accelerates. This isn’t a complete explanation, but it is the conceptual ‘bottom line’ and I don’t want to get wrapped around variability of air mass and internal engine drag among other things. For a more detailed discussion on the topic, NASA’s K-12 site has a pretty good overview (some high school math and physics employed). The most important point to remember going forward is the obvious one: At a given altitude, when airspeed is lower, the thrust is higher and drag is lower. Therefore, acceleration is greater. In Part 2, we will have a go at a top-level analysis of F-35 transonic performance.